The bigger the host, the better for its guests. That certainly holds for parasitic barnacles. A new study confirms the link and reveals the strategy adopted by these unusual crustaceans in the early phases of the evolution of their lifestyle. Rhizocephalan barnacles (Rhizocephala) are parasitic relatives of the more familiar filter-feeding barnacles, and they infect and feed on decapod crustaceans. The parasites consist of an outer sac-like structure which encloses the reproductive organs, and root-like network which they use to penetrate the tissues of their unfortunate hosts. This mode of parasitism is relatively rare, which makes it difficult to gauge the size reached by these parasitic barnacles. Now a research team led by LMU biologist Christina Nagler and Professor Henrik Glenner of the University of Bergen in Norway has used micro-computer tomography (micro-CT) to non-invasively determine the relative volumes of parasite and host in this relationship. The results reveal that there is a positive correlation between the masses of parasite and host, i.e. the larger the host, the larger the parasite. In addition, the team has applied the micro-CT method to obtain new insights into the parasite’s life-cycle, which shed light on their evolution. The study appears in the online journal PLOS ONE. The Rhizocephala belong to the class of parasites that attack the reproductive systems of their hosts, thus suppressing their reproduction. This in turn enables the parasite to exploit for its own benefit the energy which the host would otherwise invest in its reproduction to promote its own propagation. Parasitic barnacles can be divided into two groups, kentrogonids and akentrogonids, which differ in their competitive strategies. The life-cycle of the kentrogonids includes a free-living larval stage, which infects a new host. Kentrogonids also reproduce several times and release morphologically distinct types of eggs into the surrounding water. This increases the probability that their offspring will find new hosts in diverse environments. Akentrogonid larvae, on the other hand, infect their hosts immediately after hatching. They are therefore less likely to be picked off by predators, but this comes at a price: The brevity of the larval phase restricts their distribution. Nagler and colleagues investigated the population dynamics of a kentrogonid and an akentrogonid species. 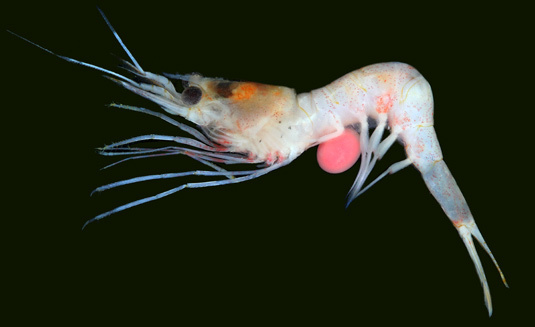 The results showed that the akentrogonid has a high rate of reproduction, and produces large numbers of relatively small eggs. It therefore follows what is known as the r-strategy. The kentrogonid, in contrast, produces fewer progeny, which emerge from eggs that are larger than those of the akentrogonid species and thus require greater parental investment. This pattern of resource allocation conforms to the so-called K-strategy. “We know from molecular phylogenetic studies that the kentrogonids are ancestral to the akentrogenids. Our new results therefore imply that the earliest rhizocephalan barnacles continued to follow the K strategy of their ancestors, the filter-feeding barnacles. The latter are sessile organisms, and therefore inhabit a secure and stable environment, which provides relatively constant living conditions, and is compatible with the adoption of the K-strategy,” Nagler explains. “When the akentrogonids emerged, they tend more to a r-strategy, which is advantageous in fluctuating environments.” The team now plans to extend the micro-CT method to explore the dynamics of host-parasite interactions involving other species.